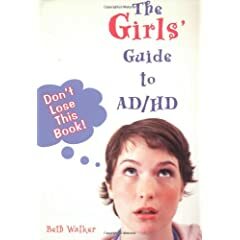 About nine months ago I reviewed "The Girls' Guide to AD/HD" and didn't hold back any punches. I described how the book and I didn't get along, as if the author had personally set out to irritate me with its content and layout. Here is one of the nicer quips from that review last March. Now, to be fair, I'm not a girl, nor am I a teenaged girl, so I am as far from the targeted demographic for this book as I am from Alpha Centauri. I still stand by my criticisms, but I'm willing to accept that there might be people out there who not only will like this book and the way it's laid out, but may even find it useful. This is why I've decided to remove it from my bookshelf and let you put it on yours. Let your friends know about this blog via Twitter, Facebook, or even email. Share this shortened url with them: http://bit.ly/mind. Please tell them why you think they might enjoy my blog. Just one post or email is all I'm asking. No spamming. Then paste what you told them here (Be nice. Don't paste their email address for spambots to harvest). I could just pick an entry at random, but where's the fun in that? I'm looking for wit, humor & creativity. I'll announce the winner on February 10th.